The trails are icy in places and bare in others. There are also wet areas showing up so beware! Roads and parking lots are bare. We are not grooming due to conditions. Trails are technically open until the 31st of March. Trail #3 North to Rockland is FAIR on the south end and FAIR on the north end. Trail #8 from Ewen to trail #3 North is FAIR. Trail #3/8 East from Bruce Crossing to the trail #3 South intersection is FAIR. Trail #3/8 West from Bruce Crossing to the trail #3 North intersection is FAIR. Trail #3 South from the railroad grade to the CC road is FAIR. Trail #8 from the trail #3 South intersection to Trout Creek is FAIR. Trail #8 from Trout Creek to Kenton is FAIR. Trail #8 from Kenton to Sidnaw is FAIR. Trail #8/15 from Sidnaw to the trail #109 intersection is FAIR. 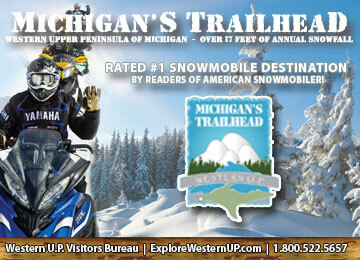 Sno Valley Riders Snowmobile Club Sidnaw/Bruce Crossing, Mi. Thank you for all your hard work. From the paper pushers to the machine operators. Without all of you the trails would suffer. Thanks again for a great season! Thank you all for the work you do and all the time you put in. Thanks for all you guys do, trails were awesome all year!!! The trails are icy in places and bare in others. There are also wet areas showing up so beware! The trails are icy in places and there are wet areas showing up so beware! Trail #3 North to Rockland is GOOD on the south end and GOOD on the north end. Trail #8 from Ewen to trail #3 North is GOOD. Trail #3/8 East from Bruce Crossing to the trail #3 South intersection is GOOD. Trail #3/8 West from Bruce Crossing to the trail #3 North intersection is GOOD. Trail #3 South from the railroad grade to the CC road is GOOD. Trail #8 from the trail #3 South intersection to Trout Creek is GOOD. Trail #8 from Trout Creek to Kenton is GOOD. Trail #8 from Kenton to Sidnaw is GOOD. Trail #8/15 from Sidnaw to the trail #109 intersection is GOOD. We will try to groom later today. The trails are icy in places so beware! I doesn’t look like conditions will allow us to groom for the next three days. The trails are going to get rough during this warm up, we will get back at it as soon as it cools off. Trail #3 North to Rockland is EXCELLENT on the south end and EXCELLENT on the north end. Trail #8 from Ewen to trail #3 North is EXCELLENT. Trail #3/8 East from Bruce Crossing to the trail #3 South intersection is EXCELLENT. Trail #3/8 West from Bruce Crossing to the trail #3 North intersection is EXCELLENT. Trail #3 South from the railroad grade to the CC road is EXCELLENT. Trail #8 from the trail #3 South intersection to Trout Creek is EXCELLENT. Trail #8 from Trout Creek to Kenton is EXCELLENT. Trail #8 from Kenton to Sidnaw is EXCELLENT. Trail #8/15 from Sidnaw to the trail #109 intersection is EXCELLENT. Thanks for the hard work this season, you're trails have been awesome!